This one is for someone who loves cats, so I crocheted a couple of cats and have also made a couple of mice to sew onto the top too. This project brought with it a new skill learnt in the form of a very simple cable, which will make me a little less daunted on the next project. The little flowers are crocheted on a 2mm hook with thin yarn. Its not exactly YOP work, but then what I have started on, is not worthy of a photo at this stage! More next week hopefully! We have grabbed the chance of a dry afternoon to get out and about....today on a different path than we normally take, and it made for a great walk for kids, dogs, hubby and me. We had a couple of incidents with wellies left behind in thick mud, but that is when you're glad that you are jumping into a farm vehicle on the way home, and everyone strips off as they come through the door so it can all go in the machine! We live in a beautiful area, with plenty of lovely places to walk, but of recent, I've really wanted to get in among the trees, its definitely something new in me.......and I long to walk in the woods all week, so I'm afraid come the weekend, the kids often don't get to go anywhere unless there are trees there! Today's walk was right by the sea too, I love to see the boats when the tide is right out....leaning... waiting for the sea to return. Well that about sums it all up, I'm looking forward to sitting after supper and reading about your first week of progress.....to see other Year of Project work, check out the ravelry page here. cute cozy! i kinda wanna get a tea pot so i can make one! Great cozy. Like Shateen, makes me want to get a tea pot so I can have a cozy too. You do live in a lovely area and are so lucky to have such lovely scenery around you. I love the cat tea cosy! I dont use a tea pot either though I have several, only Tony drinks tea and he uses a t bag! Wholeheartedly agree with Marsha, you live in a fabulous area I love to see your pictures. I can't believe all these deprived people with no teapot! You poor souls. I think I have 2, but secretly covet a huge one for builders brew. 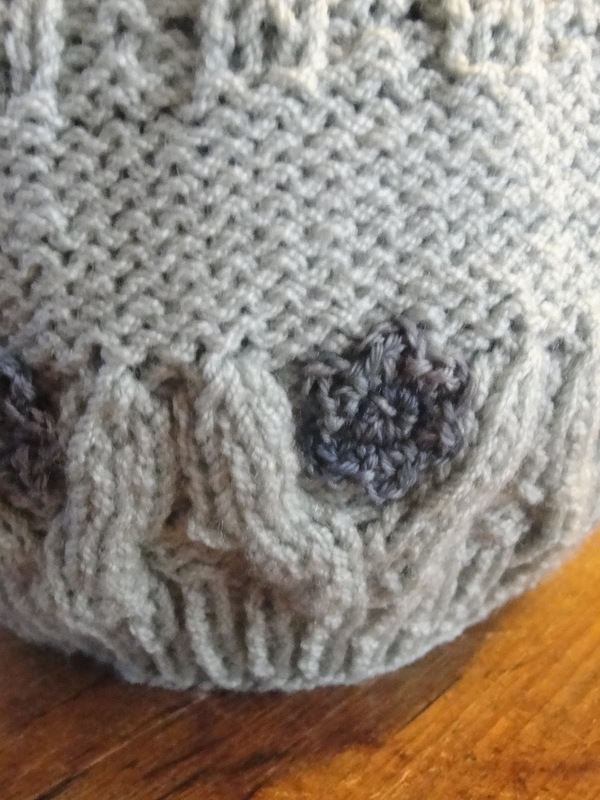 Anyway, that is an achingly cute tea cosy and your friend is very lucky indeed! I love all your pictures, they always remind me that I'm a quarter Welsh even though I rarely make it over the Severn Bridge these days. You are so fortunate to have a such a range of beautiful landscapes to enjoy with your lovely family. Your tea cosy is so cute, I love it and as for walks in the woods love them ! 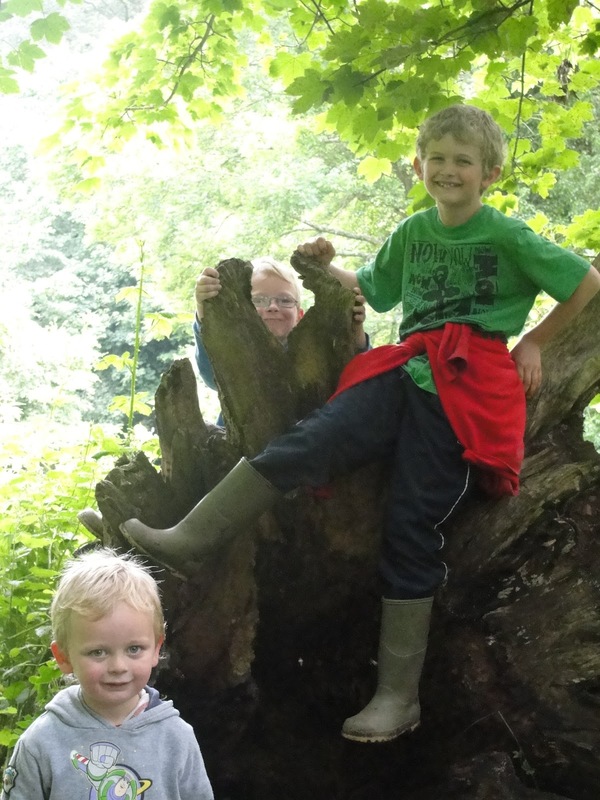 As someone who orienteered at a national army level I've always felt at home in the woods and what with the endless prospects of climbing and getting mucky I reckon its every little ones dream lol. 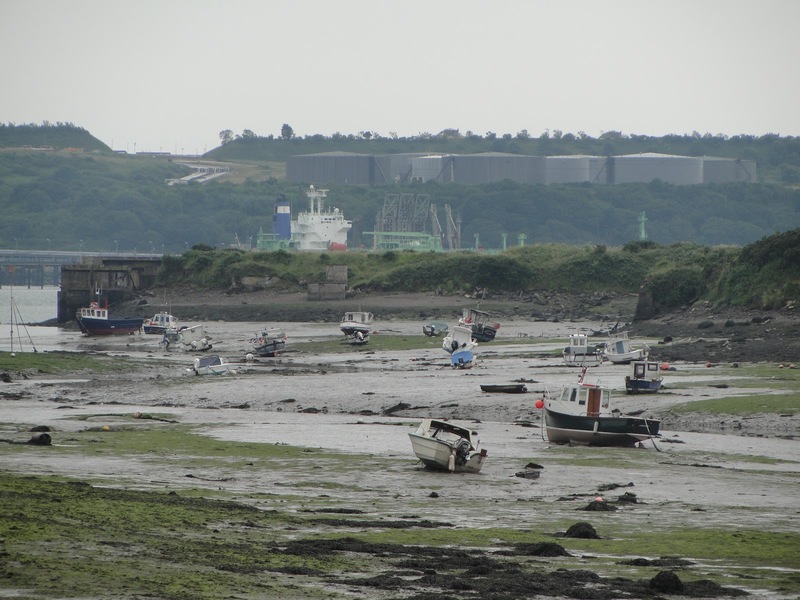 Love the picture of the boats, you can imagine they've just be dropped there patiently waiting for the tide to return. What a lovely walk you seem have had--I so wish I lived that close to the sea--I never get tired of driving to the ocean here, but we never seem to have time anymore as it is a 2.5 hour each way drive. What a perfect cozy for a kitty lover! You have your hands full with three boys, yeah? They're a handsome bunch. How interesting ppl leave their boats like that. That's the first I've seen them left a shallow area. In Tahoe, boats and jet skis are left way out from the land and I guess one has to paddle board or row to one's engine. Everyone claims to like the bag better, but they always empty the pot..! Love the cozy! I need to make one for my list and have been finding several I like but nothing started yet. Might have to get on with that this week!!!! love love love your tea cosy its adorable & bonus you learnt a new skill too. Your pics are wonderful, i love the pics of the boats with the water out. I love the cozy! I want to make one for my food processor to protect it from dust. Great cosy, and I love the touch of cable. Your little guys are just so cute. That cozy is so cute, I absolutely love the cats! I haven't done a YOP progress report, I've barely begun, but I'm thinking of starting a separate blog page for project tracking. Lovely tea pot, I really have a thing for grey.... The cats are too cute. We haven't been out doing near enough walking recently, I really miss it! Faith, your tea cosy is adorable! It's funny how I often quietly yearn for grey after a period of bouncing off every joyfull colour under the sun. Clever you for mastering cables. I have yet to pluck up the courage for those. 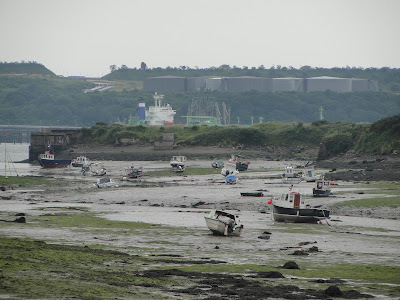 Your lowtide view reminds me of where we lived off the ooast of Normandy. I'm wondering, of course, whereabouts that picture was taken. Have a lovely week. It continues to be overcast here. But Faith, as we both know,trees equal sticks - so I bet your boys don't take much persuading to go for woody walks! That tea cosie is just great - I think your friend will love it - lucky her! Wow! You just whipped that tea cozy up and it's not even a YOP? You're a knitter alright...I am such a novice but I love that tea cozy! Is there a pattern for that? Cables? Oh boy...I've never done those. Let's face it, I haven't done much of anything! LOL! Your children are so sweet...in pictures at least! I raised 4 so I can spot mischief a mile away. They are so precious. I thought a terrible catastrophe had taken place with the boats! LOL! It's just the tide is out....evidently they don't worry about wanting to go anywhere until it comes back. I ordered yarn....getting my sticks warmed up for some knitting! It's sooo good to be back on line and see your posts that I missed. 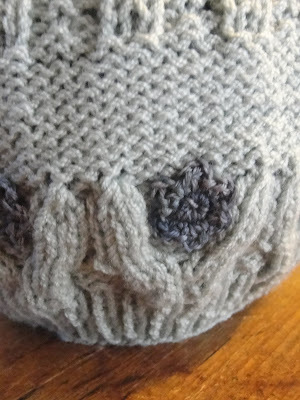 I adore this tea cosy, it's so clever with the cat sitting on a "wall" of knitting. You certainly have become quite the ninja knitter, super speedy and such clever makes. 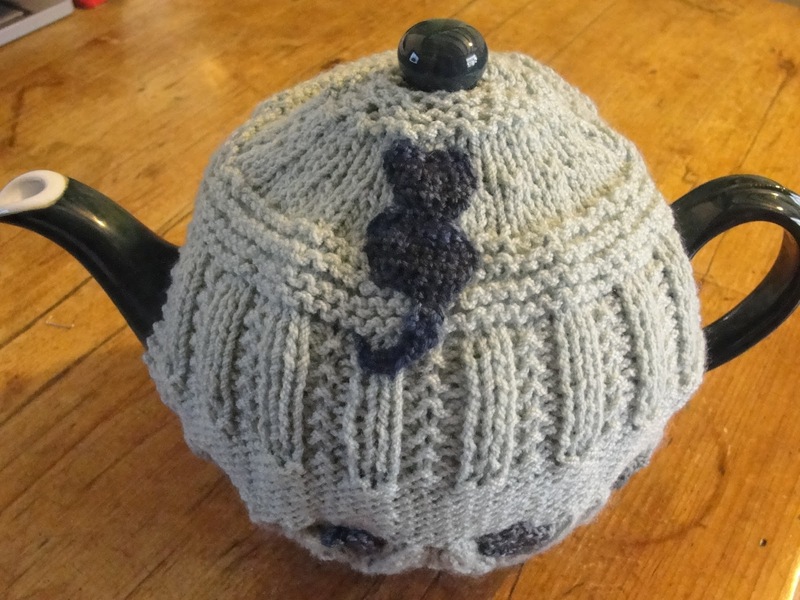 I've been wanting to knit a tea cozy for a friend's upcoming birthday so I loved seeing yours. It's completely adorable! Hello Faith, I popped across from Penelope's after reading the lovely comment you left there. I don't knit these days but your knitted 'people' have almost tempted me back! Could I follow a pattern like this, however? It used to be just pullovers for the boys, or basic baby clothes. Love the action shots of your boys, I am up to my eyes in grandsons at the moment, also trying to find fun things to do in the rain! Great post, thank you! Love the pic with the tide out..I live near the woods and always want to be near the sea! You are so crafty. I love your energy! I agree with what you were saying in your previous post about considering selling things you make. When you look at how many hours it can take to make something and add it the cost of the products used you would be hard pressed to find someone willing to pay a fair price. Not when most things can be bought mass produced in big cheap shops. I guess that's why it is so special to give homemade gifts. You can't put a price on them! Lovely happy photos. The tea cosy is cool, its made me really think I need one now! Getting the show on the road!